In 2015, we launched our new employer brand “Let’s be smarter together”. We first addressed graduates, highlighting the culture and opportunities that come with our vision of “making the world more resilient”. 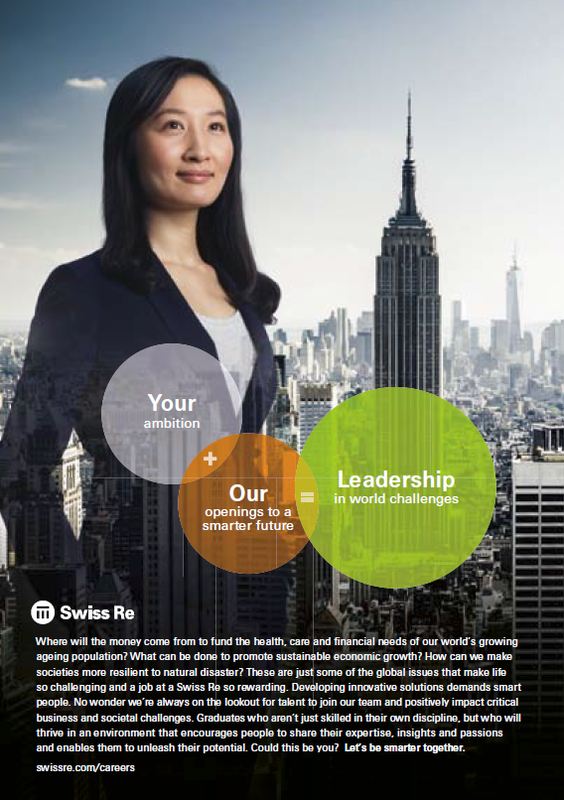 In 2015, Swiss Re communicated a new compelling vision: “We make the world more resilient”. To fulfil this ambition, we are committed to building a diverse organisation in which our leaders inspire and engage their teams to unleash their full potential. Our goal is to make Swiss Re a place where the spirit of collaboration is “Let’s be smarter together”, since together we can achieve more than we could on our own. Where we build the foundation for the changing needs of the future, drawing on the know-how and experience of a diverse, multi-generational group of people. Where a flexible and inclusive culture is the norm and everyone can contribute to an organisation that is constantly looking for new ways to improve the wellbeing of society. Where there is trust, respect, cooperation and responsibility. Where how we achieve results is as important as what we achieve. For this reason, we have developed a new People Strategy. This sets out our ambition to adapt to a changing and more diverse workforce and its needs, develop a more commercial edge as regards people management, improve the skills of our leaders so they can inspire and engage our employees, and create a culture of collaboration where employees feel empowered to act. Swiss Re is a global company with a presence in all major markets. As of 31 December 2015, we employed 12 767 people (regular staff) from 89 nationalities: 60.2% of them were working in Europe (including the Middle East and Africa), 26.4% in the Americas and 13.4% in the Asia-Pacific region.